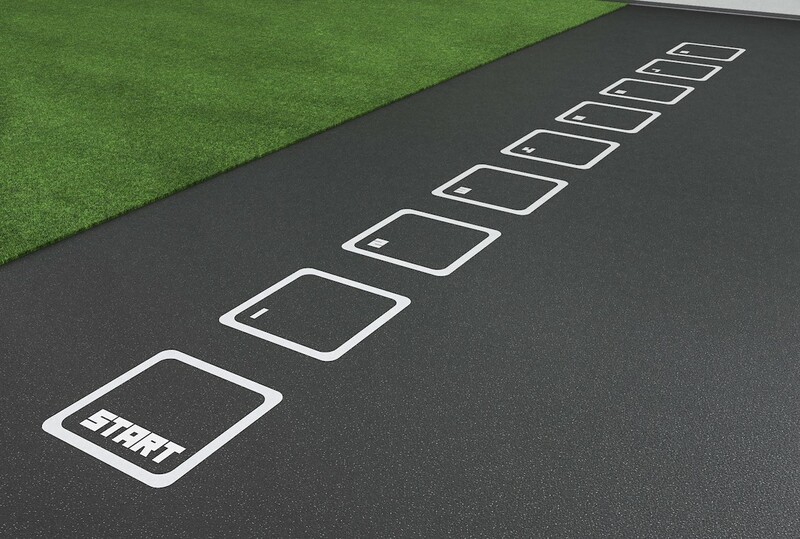 Floor Graphics › gym floor graphics for fitness facilities. Learn how fitness floor graphics can add value to your health club design features and exercise program by creating defined exercise spaces for your members and group fitness participants. What are engineered gym floor graphics? Fitness floor graphics are uniquely designed patterns and markings used to help people visualize exercise movement patterns. Think of our floor graphics as you would think of designated, defined, exercise areas. Our gym floor graphics can enhance the use of specialized exercise equipment, functional training and exercise areas, and maximize floor space for complex movement patterns or group exercise. As visualized in the video above, each floor graphic design is applied on top of your exercise flooring. All of our products and exercise flooring solutions are engineered to stand-up to daily use in your gym or exercise facility. They are manufactured using special abrasion and scuff resistant materials. Our three component, engineered graphics are designed to take on the toughest use in gyms, health clubs, personal training studios, group exercise areas, and athletic training facilities. How long does it take from the time I place my order until I receive it? Stock product orders, like our landing dots, ladder graphics, and four-square patterns in the video above, are often completed within 14 days (excluding late submissions and holidays). Custom graphic jobs may take several days longer to complete, depending on their complexity and size. Custom floor graphics include markings with or without your company logo, kettle bell training, TRX®, Precor®, Life Fitness® (Synrgy™), Star Trac® and other special stylized graphics. With custom orders, we’ll provide an estimate of the turnaround time for each order, and we will always work with you to find ways to complete your project on time within budget. What is the difference in our floor graphic solutions vs flooring competitors? Do you operate a gym or health club? Our exercise flooring solutions are perfect for gym or studio owners who are concerned with maximizing return on investment as our floor graphics allow you to utilize underserved areas of your existing exercise floor space — our markings define existing exercise programming! Our engineered graphic may be applied to new or existing flooring types. Our graphics adhere to rubber, tile, concrete, wood and synthetic wood. Our competitors offer solutions that require the user to invest more money in new rubber flooring — why waste money? Our solutions do not require new investment in additional flooring. We show gym operators how to reinvented usable space in various training facilities. Imagine how much revenue you are losing giving up as little as 500-800 square feet to as little as 2, 3, or 4 participants. With our engineered graphics you can maximize return on investment by opening up available floor space — without replacing flooring — to accommodate up to 20 participants in one exercise area. It’s a clear and compelling proposition. Group exercise isn’t a fad, in fact group exercise is booming. With renewed focus on functional training and athletic training, converting an underutilized exercise space (e.g., a racquetball or squash court) is viable, sustainable, and a clear winning value-added or revenue generating proposition. Our gym flooring solutions are designed for long term use, but allow the user to remove the graphics at a future date without damage to the floor or heavy residue. The cost difference between our flooring solutions and our competitors flooring solutions are huge — only 20% to 25% of our competitors offerings. One other important difference is production time. Our competitors typically require from 8 to 14 weeks to produce and ship their flooring solutions and our typical production time is less than 2 weeks. We also save a great deal of costs for our users on shipping, our graphics weight very little and that makes our shipping costs extremely low compared to shipping thousands of pounds of additional new rubber flooring. We hear it over and over again, “we’re buying and replacing perfectly good rubber flooring for markings.” Yes, gym operators need and want floor markings for their members and clients but they, like you, didn’t actually need to replace flooring. Are our floor graphics easy to install? Yes. If we met at IHRSA, FIBO, NIRSA, or other trade shows, we showed you how easy our graphics install on a wide variety of flooring surfaces. We take pride in the ease of installation of our exercise flooring solutions, but we do recommend that you seek the help of a professional graphics installer. We provide illustrated installation instructions with each graphic purchase. Additionally, we will be offering flooring graphic installation video tutorials, and customer service line, for DIY home, Crossfit™, box, gym, and personal training studio installations to help you make each graphic installation successful. What are the benefits of using our engineered floor graphics? Would you like to learn more about our floor graphics? If you are responsible for operating a gym or fitness facility, and you would like to develop more sophisticated systems and experiences for your members and clients, please contact us today. If you would like to simply comment on our design portfolio, we want to hear from you.